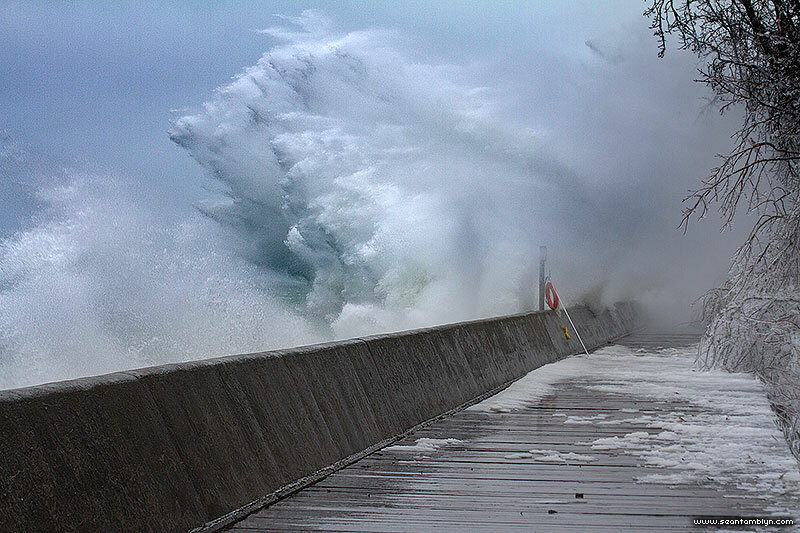 A giant wave explodes against the boardwalk breakwall during an April ice storm, sending spray high into the air. It was like walking the base of Niagara falls – I’m still drying out. This entry was posted on Monday, April 16th, 2018 at 7:40 pm. It is filed under Featured, Lagoon Report XXXIII, Lagoon Reports and tagged with Canon EF-S 60mm f/2.8, Canon EOS 7D. You can follow any responses to this entry through the RSS 2.0 feed. I was out noonish Monday. Judging by the rocks on the boardwalk ,broken trees and displaced boardwalk, the waves at the west end must have been breaking clean over the break wall.